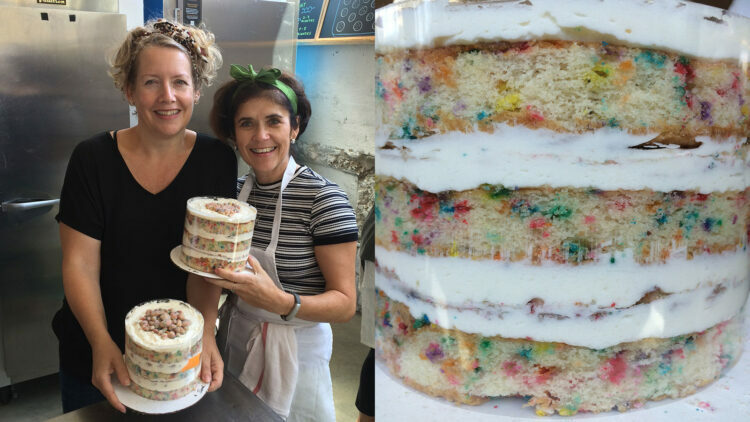 I recently went on a course to learn how to make cakes from chefs at the famous Milk Bar in New York (the sister bakery of Momofuku). This was a present for my 50th birthday (there I’ve said it and it’s out there) from my special friend Sarah. 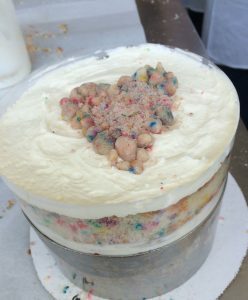 This cake-making day made me feel so happy that it made me wonder why baking has such a positive effect on us. My first memories of cake baking were licking the bowl after my Mum had made a Victoria sponge. I must have only been four or five years old. I can recall the moment in an instant – licking that lovely delicious creamy vanilla eggy mixture. That’s how I learned to make (and eat) cakes. I’ve passed the baking skill on to both my daughters who are now very accomplished bakers and my 21-year-old son (who even made my birthday cake this year). It made me realise that if we don’t bake cakes and share our know-how with future generations these cake baking skills will die out. The great thing about making your own cake is that you know what’s in it. There are no synthetic flavours, no emulsifiers, no E numbers, no preservatives or trans-fats. Just the raw ingredients YOU choose to use. You can go healthier with a carrot or courgette filling and use wholemeal or treat everyone and be truly indulgent with chocolate and cream. It’s your choice. Cake baking has become incredibly popular in recent years. Who would have thought that the Great British Bake Off’s transfer from BBC1 to Channel 4 would be headline news? I feel a great sense of satisfaction when I put that last piece of icing on the cake that I’ve made and I don’t even mind if it goes wrong. Cake baking for me is a form of relaxation and a time to switch-off. I discovered recently that the feelings I experience are actually backed up by mental health research that says baking boosts confidence, increases concentration and provides a sense of achievement. Mental health charities are using baking as a form of therapy because it encourages a sense of self-worth as people take pleasure and pride in something they have created. It’s well documented that exercise releases endorphins, and so can baking. At bartlett mitchell our cakes are home-baked and I am lucky that in the interests of quality control and customer service research I get to try lots of them. The reason bartlett mitchell can offer home-baked cakes is because of our Chef Director, Pete Redman’s emphasis on training good craft skills. Our chefs have the knowledge, skill and confidence to bake great cakes. I’ve got some standout favourites bakers – Magda who works in one of our large regional outlets produces the most amazingly delicious cakes that not only taste lovely, they look stunning too. On a serious note cakes can be a ‘force for good’. The Macmillan World’s Biggest Coffee Morning takes place this week and the whole bartlett mitchell team will be involved in this fundraiser. Everyone from kitchen porters to the chairman and the CEO’s daughters have been baking cakes to raise money for this very well deserved charity. So far this week we’ve already raised over £2,000. So don’t buy a shop cake, support Macmillan by baking your own cake. And if you’re stuck for inspiration you can try this show-stopping recipe I learned at the Milk Bar or why not try this recipe for a ‘Flourless Chocolate Cake’ from Chef Director, Pete Redman. Finally, Delia Smith wrote in her ‘Book of Cakes’ published in the 70s that “Cake is a symbol of love and friendship – if someone actually goes to the trouble of baking a cake for family and friends they can’t fail to feel spoiled and cared for”. So show someone you love them this weekend.